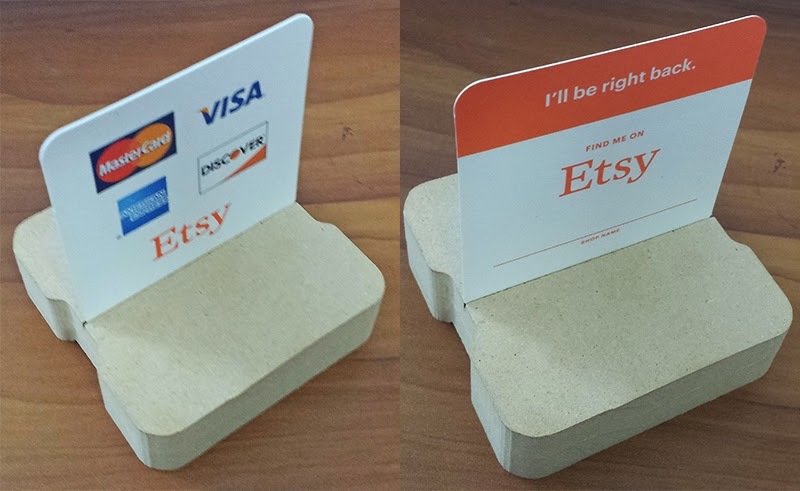 Etsy recently announced their own gadget for taking credit cards, but with a new twist from other card readers. 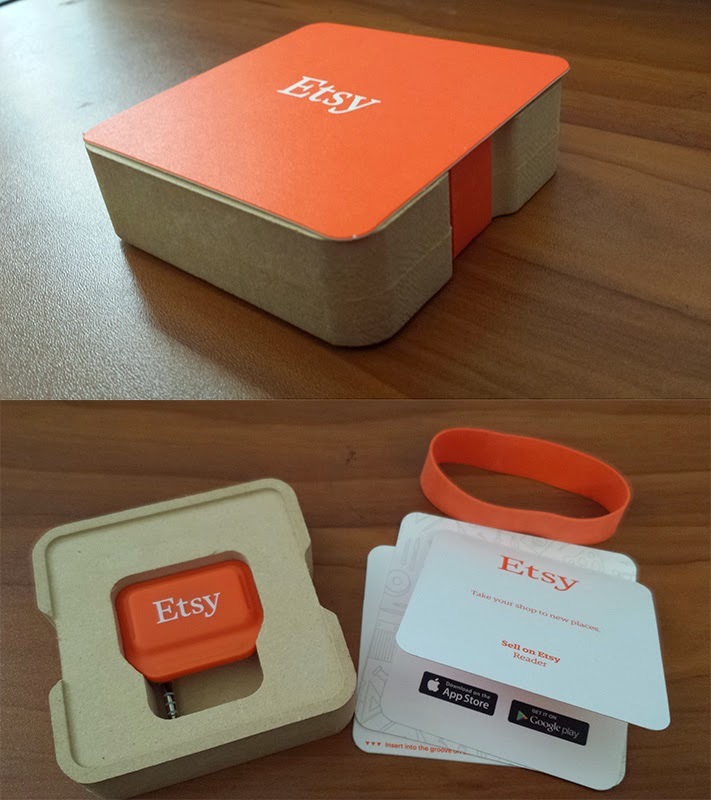 It's meant to sync with your Etsy shop and provide a branded smooth experience for your in-person sales. I got mine in the mail yesterday (it's free if you request one) and put it through a quick test run. First off, their packaging was excellent, as I would expect from the premiere handmade marketplace. I got a few ideas just from their clever and simple presentation. Here's the envelope it came in. I love the idea of a branded envelope sticker. The reader itself came in a sturdy reusable custom cut box made of what looks like composite wood. Again, I love the brand consistency of the reader and insert cards with the orange and white. Extra bonus! The box itself has a slot on the underside where you can place the card to make a stand up sign. One side of the card shows that you take credit cards while the other side is a "I'll be right back." sign with a spot for you to write in shop's address. I ran two test transactions, one of an item which was already up in my online shop and another which was a new 'quick sale' item not already present in my online shop. You will need to let the app access your location and your microphone. Your location is recorded and inserted into the receipt e-mailed to the customer later on, should they elect to receive one. The hub of the app looks like this on an iphone. Be aware that a minimum $1 transaction is required for a customer to use a credit card. You can also set your sales tax rate in the Settings so that this is automatically calculated when making your sales. The funds from your credit card are added to your Shop Payments account (the same place as your Direct Checkout funds), so you will need to wait the usual time for the money to be deposited after your sales. This usually isn't more than a couple of days, in my experience. You choose the item in your online shop to sell in-person via a list. The shipping fee is automatically waived when an item is sold in-person. The item is also removed from your online shop when it is sold, which will help save headaches on syncing inventory automatically instead of manually (ie. if you've ever had an item sell while you're out at an event and had to deal with the headache of explaining that it sold when you get back home). There is no Etsy transaction fee like there are for online sales, only the credit card processing fee, which is comparable to other readers (2.75%). It is still counted towards your sold items stats, but only you as a seller can see those transactions in the Orders section of your shop. There is no transaction fee or listing fee, only the credit card processing fee. Location map blurred for privacy. I've asked my test customer to let me know what kinds of e-mail he receives in the future so I can see just how often these e-mails are sent out and what kind of info they include. I will edit this post with an update once I know more about these communications. Why is this powerful, you ask? The items suggested at the bottom of the e-mail offer the customer a tantalizing glimpse at your other items, some of which they might be interested in that you might not have had on display where they were shopping in-person. Because these images actually link to the items, they encourage further purchases without the seller having to lift a finger. This e-mail communication is a powerful addition to simply handing out a business card, since business cards are easily lost and most shoppers require repetition of information before they truly retain that information. So far, this is the only e-mail my test customer has received, which gives me hope that these won't turn into spammy communications. Also, Etsy's current online market doesn't have a function that lets you automatically add your past customers to a mailing list, which is a feature I've always wanted. I currently have to first ask for the customer's permission to add them to my mailing list, then add them in mailchimp manually, which takes up valuable time I could be working instead. My newsletter only goes out once every 3 months, so I am curious to see how often this Etsy-managed newsletter will be sent out and how they might mesh with the information I already send out in my newsletter. 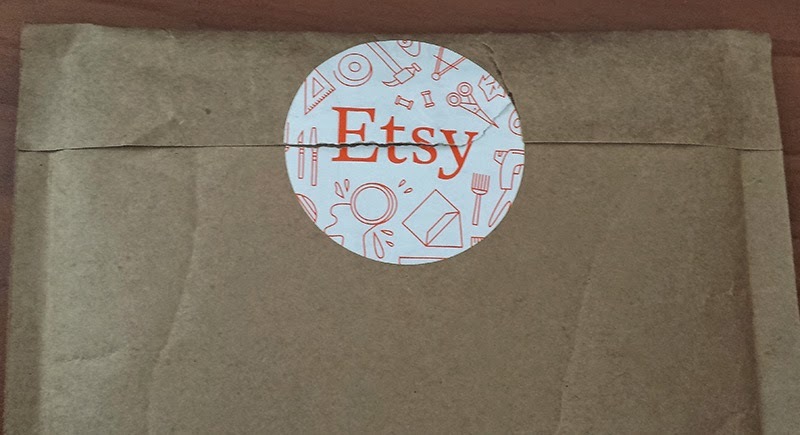 The Etsy card reader doesn't do anything vastly different from other card readers, but it does allow powerful synchronization options between your online Etsy shop and your physical inventory that could save you time if your Etsy shop is your main outlet for sales. It also allows for promotional automation that doesn't require you to lift a finger, saving you time, especially if you do not yet send out your own newsletter yet. More updates to follow when I have them!